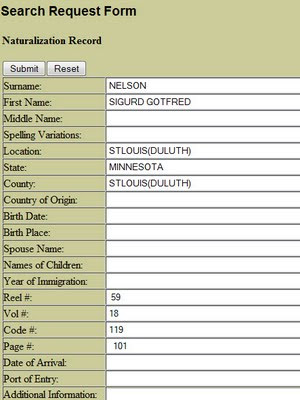 If you've read previous posts, you'll remember that I am searching for the wife and child of a man named Sigurd Nelson. The researcher who's interested in them believes that they died of influenza before 1920 but he doesn't know anything more about them. I have reason to believe that the Sigurd Nelson who was living in Duluth is the man the researcher is interested in and I was hoping that this Sigurd's naturalization record would give me the name of his wife and child. Finally--a clue. 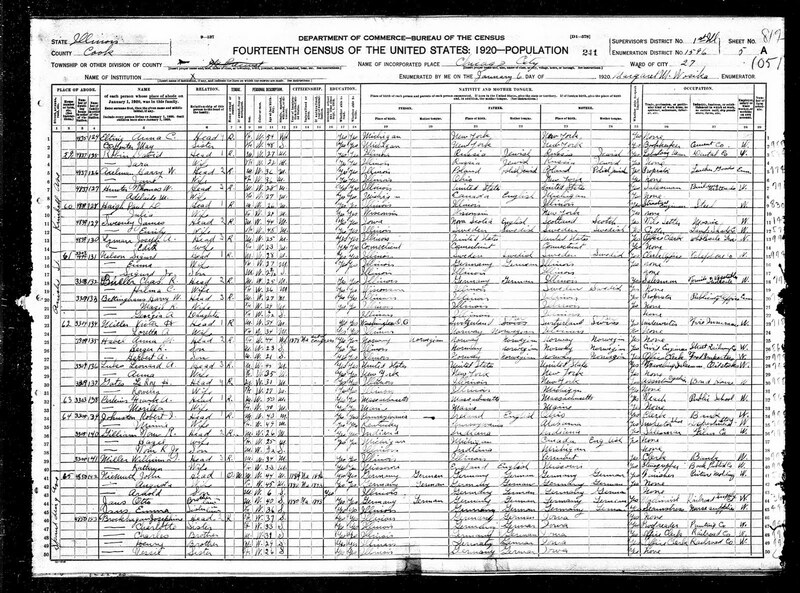 The naturalization took place on 7 May 1920 and Sigurd's wife was listed as Myrtle, born 19 November 1899 in West Duluth, Minnesota. 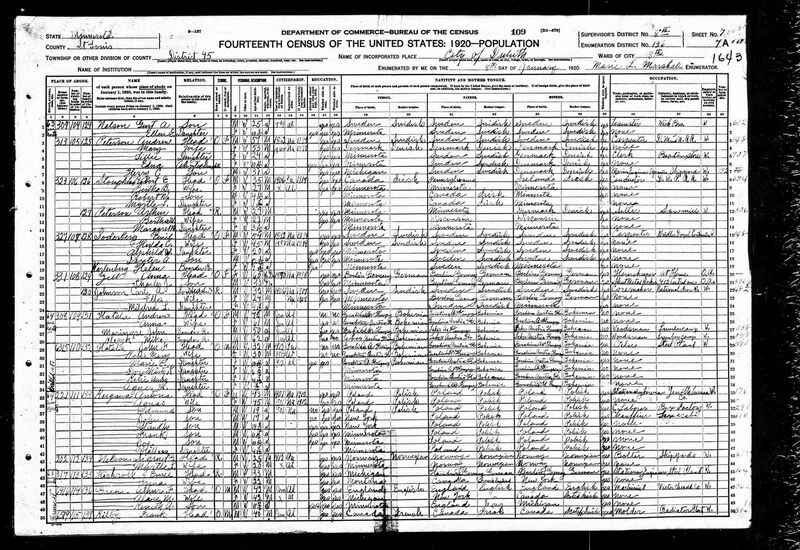 A quick search of the 1920 census told me that Myrtle's middle initial was "L."
So, the Duluth Sigurd Nelson married a woman named Myrtle L. sometime between 5 June 1917 (draft registration card) and 8 January 1920 and it's very likely that he married her in Duluth. Even though the researcher told me that he thought the wife and child died before 1920, I don't think I can rule this person out. 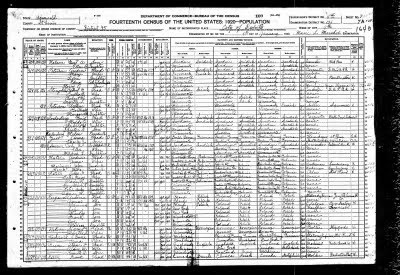 It's possible that the "before 1920" conclusion was made because the family hadn't been able to find the family in the census in Chicago. 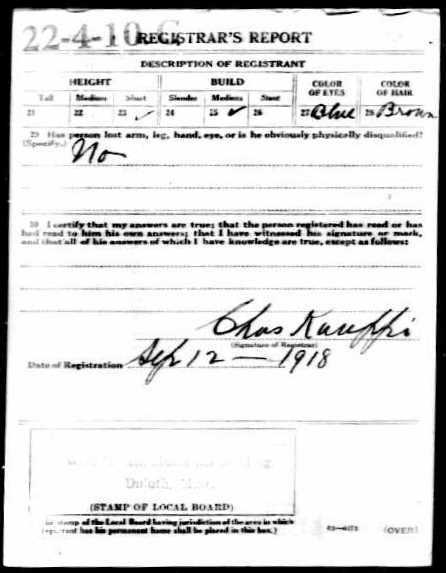 Look for the death of a Myrtle Nelson in Duluth just after 1920? Look for Myrtle's death in Chicago? Look for a birth record to a child born to Myrtle and Sigurd? See if I can find Myrtle and Sigurd in the 1930 census to rule them out? Check Duluth city directories to see if Sigurd appears and if he then disappears? What do you think? I'd love to hear your ideas. Recently a researcher asked if I could check indexes at the Circuit Court Archives for a crime that happened c. 1922. I'm always happy to learn something new and so I said I'd give it a try. I'm no expert on using this resource, but maybe a few quick notes about my experience will be helpful to someone else. The microfiche index with the title "Counter Index Alpha Criminal Div" is kept in a thick black notebook on top of the filing cabinets. It covers 1873-1944, but some years are missing. The entries for the earliest years are docket book pages. Information includes the name(s) of the defendant(s), the indictment number, the reason for indictment, a dollar amount that's probably bail, and brief dated notations that probably document various steps as the case proceeds. One of the cases had a December 1879 entry that seemed to read "Cont [or Cout] by Agt" and an August 1880 entry that said "Stricken off &c."
The later years have index pages with columns that read "Defendant," "Original Indictment #," "Charge," and "Amt of Bail." The pages are numbered and a date (month/year) is often stamped on. The entries aren't alphabetical, but they're grouped by first letter of surname in chronological order and they're fairly easy to search. In my search, I looked at names and then checked the Charge column to take a closer look at the cases that might have been a match. What's the next step if you find a match in the index? The best answer can be found on the Archives list of holdings. If the records are still available, follow up. If not, perhaps the information gleaned from the index would lead to newspaper articles or other indirect sources of information. For my search, I didn't find a match, but the files for the 1922 cases aren't available anyway. If I had been successful, though, the indictment records still exist. 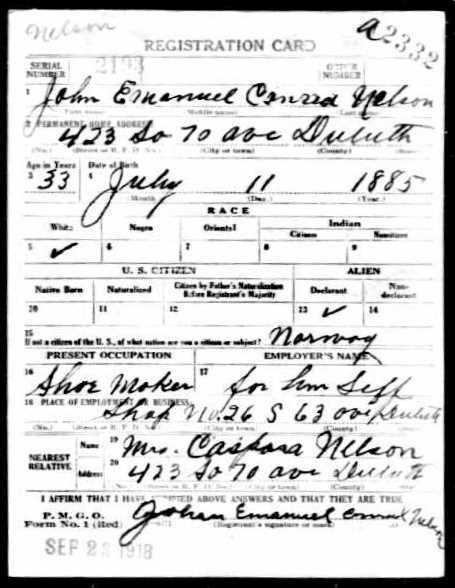 The researcher who is looking for Sigurd Nelson's family members provided me with new information a couple of days ago and looking back on it tonight, the birth place he sent reminded me of the World War I Draft Registration Card that I mentioned in a previous post. The "Kristiana, Norway" from the email seems like a great match for the "Christiana, Norway" on the card for Sigurd Godferd Nelson. Earlier today I had a hunch that I might be on the right track. Now I'm thinking that I really might be. 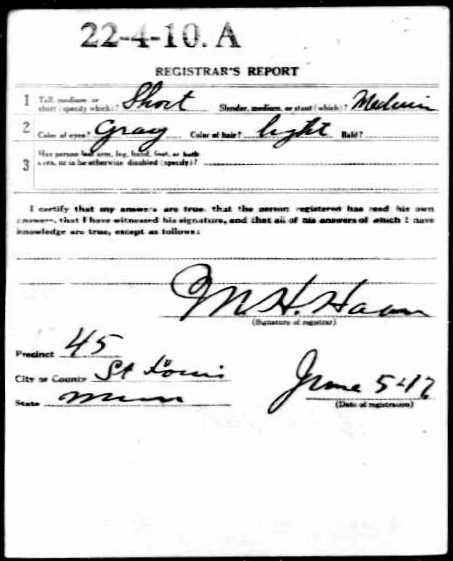 The Duluth newspaper mentioned that Sigurd G. Nelson had naturalized with other veterans in 1920 and I decided to go looking for an online index. I found one at the website for the Iron Range Research Center in Chisholm, Minnesota. A search for Sigurd Nelson brought up five possibilities with one clear match. The fee to order the record was $10 and I went ahead and placed the request. If Sigurd filled out the usual forms, I'm very likely to find a spouse and child listed. If not, it was worth the gamble. I think I will put this search on hold until the record arrives and then pick it up again. Fingers crossed. It would be so much easier to search for deaths if I had names. Note: If you haven't been following my posts, you can find background information for the search in The Search for Mrs. Nelson and Child Begins. A number of years ago I spent some time searching Duluth newspapers at GenealogyBank.com and so I decided to see what I could find out about Conrad and Sigurd Nelson using that approach. 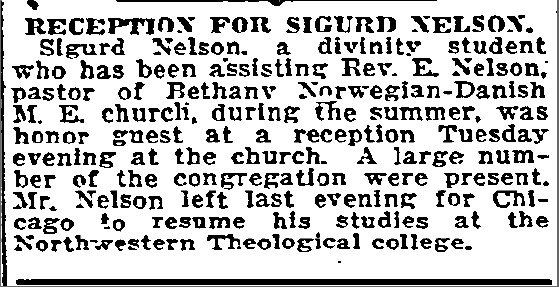 A search for "sigurd nelson" in Minnesota newspapers brought up seventeen results. One was a mis-match. Seven were for a Sigurd G. Nelson who was an elected representative from Ironwood, Michigan. That left nine possibilities. Among them I fould Sigurd the divinity student and Sigurd the young single man attending social events. It's possible this is the same person. Then I found Sigurd the soldier--possibly two men. One was mentioned as Sigurd and the other was mentioned as Sigurd G. Sigurd G. returned to be naturalized after the war. And then there were two mentions of a Sigurd being arrested for vagrancy, one before the war and one after. It's hard to tell if this is one man or two but it's likely that it's not the divinity student. I'm not sure what to think except that the Sigurd G. who went to war is a possibility if the brother of the man I'm looking for was living in Duluth. I'll think on it over night and decide what my next step will be. In the meantime, if you have suggestions, please post. The researcher tells me that Sigurd was born 13 January 1894 in Norway and I've decided to try to use that information to find a matching record in Ancestry.com's World War I Draft Registration Cards, 1917-1918. I usually start with bare bones information to see what I'm up against and a search for "sigurd nelson" yielded 316 matches--to many to scroll through at this point. I edited the search and added a birth year of 1894 +/- 2 years. That narrowed the search to 218 results. I'm not 100% sure that he was living in Cook County at the time he would have registered, so I added a January birth month. This gave me three results. The birth dates for the first and third were close enough to earn a careful look. The third man was single, born in Christiana, Norway. He was employed as a car repairer for a railroad. Checking my notes, the researcher hasn't mentioned Sigurd's birth town but he did give me additional information. Conrad, 15 Jun 1885, married to Caspara Christenson and living in Berlin, New Hampshire in 1916. Son Arthur died at age 1. Their parents were Johannes Magnus Nilson 1852 and Anna Kristine Kristensen 1858. I decided to look to for a draft registration card for Conrad to see where he was born. Searching with the birth month and year returned 384 possible matches, none with the exact birth date. I narrowed the search to New Hampshire with no luck. 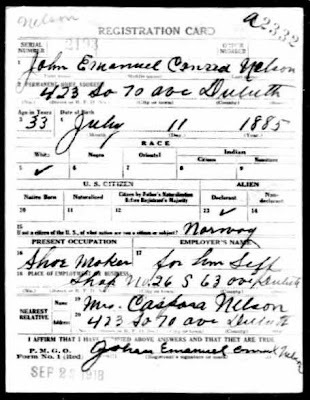 Scanning down the list, though, I found a John Emanuel Conrad Nelson born 11 July 1885 living in Duluth. (It wouldn't surprise me to find an unmarried brother living in the same place as a married brother especially since the researcher had suggested that Conrad might have taken care of Sigurd's wife and child when he went off to war.) This man's wife is listed as "Caspara" which matches the name the researcher gave me. I was hoping that the addresses on the two cards would match, but they don't. I'm not one to jump to conclusions but when something seems promising, I like to follow up. I think my next step will be to find out more about this Sigurd and Conrad Nelson. 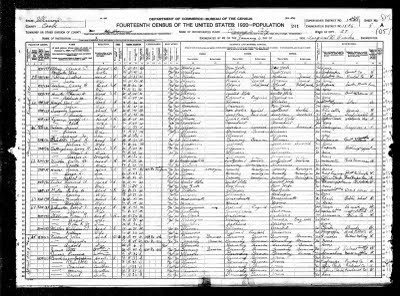 FamilySearch's Illinois, Deaths and Stillbirths, 1916-1947 seemed like a good first step because spouse names are included the database. *Sigurd A. M. Nelson Jr., the son of Sigurd A. M. Nelson and Anna W. Bietan who died 23 May 1921. His birthdate was given as 20 Oct 1817 but he was three years old so he was likely born in 1917. *Anna Cathrine Maurer who died at the age of 44, the daughter of Sigvard Nelson. 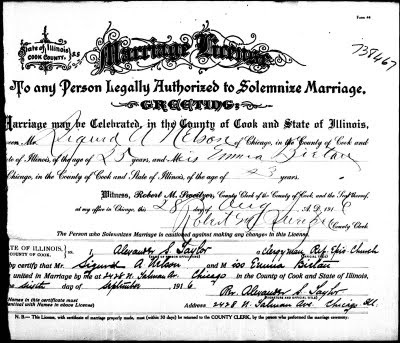 I decided to follow up on Sigurd A. M.
A search for "sigurd nelson" in FamilySearch's Illinois, Cook County Marriages, 1871-1920 brought up 13 matches. The researcher told me that Sigurd arrived in 1912, so repeated the search with a narrower date range and got five results. Four were for women named Sigrid. One was the match for the parents of Sigurd A. M.
I know that Sigurd was born in Norway but I can't rule out the match based on the groom's birthplace. 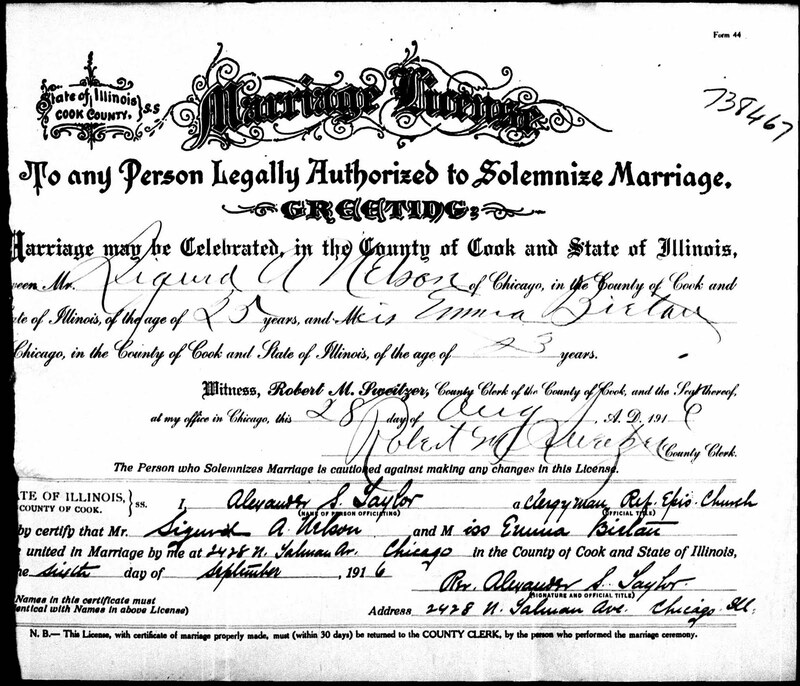 The Chicago marriage licenses didn't ask where the parties were born; they asked where the parties were living. I decided to learn more about Sigurd, Emma, and Sigurd, Jr. from the 1920 census from Ancestry.com. According to the census, Sigurd was born in Illinois to Swedish parents and Emma was born in Illinois to German parents. Sigurd is an office clerk for a telephone company. Based on birth place, this doesn't seem like the person I'm looking for but I won't rule him out yet. 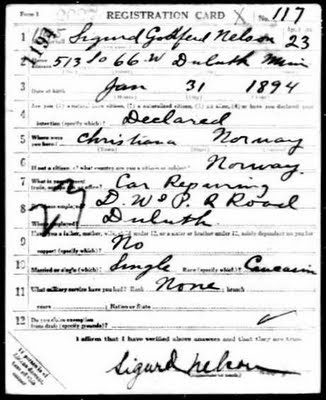 Notice that the marriage license lists the bride as "Emma Bietan" and the death record gives the mother as "Anna W. Bietan" and the census lists the wife as "Emma" with "Sigurd, Jr." in the household. I think Emma and Anna are the same person. Looking back to the first death index search, there's a Sigurd A. Nelson with wife Emma who died 16 Jan 1944. I think I can cross this family off the list of possibilities. So, back to square one a little farther ahead. I decided to make a quick check of the directory at Footnote.com. The best choice was 1917 but there was only one image available. (I KNOW that but I always forget. I'll have to use the microfilm copy the next time I'm at the Family History Center.) I checked 1923 instead. There were four people of that name in the city in 1923. 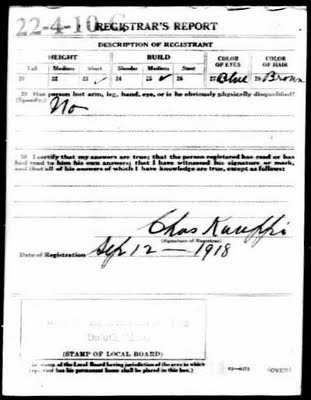 I think I'll poke around in World War I draft registration cards next to see if I can figure out where Sigurd was living and what his occupation was. If I had an address, I could look for matches in the Chicago Death Index, 1871-1933. 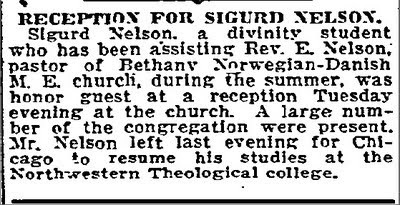 Recently someone asked for help finding out what happened to the wife and child of "Captain Sigurd Nelson." I haven't been able to turn up anything quickly but I think there are answers in Chicago records and I'm not ready to give up. I thought blogging might be an interesting way to keep track of a multi-step search done over a number of days and so I offered to take on the project as a no-charge challenge in return for permission to talk about the search in a public forum. Wife died in a flu epidemic, 1918-19?? I can think of many ways to approach this search but I think the most obvious first step is to check FamilySearch's Illinois, Deaths and Stillbirths, 1916-1947. Spouse names are often included in the search results and a death record for a Nelson woman who died c. 1918 with a husband Sigurd would be a very likely match.